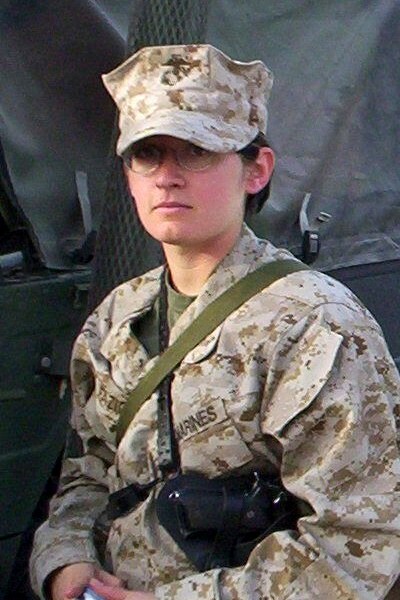 I’ve been profiling some women veteran-writers here on this blog of late, and today I’m happy to welcome Teresa Fazio, a former Marine who is writing a memoir about her experience with the Corps and particularly about her time in Iraq. 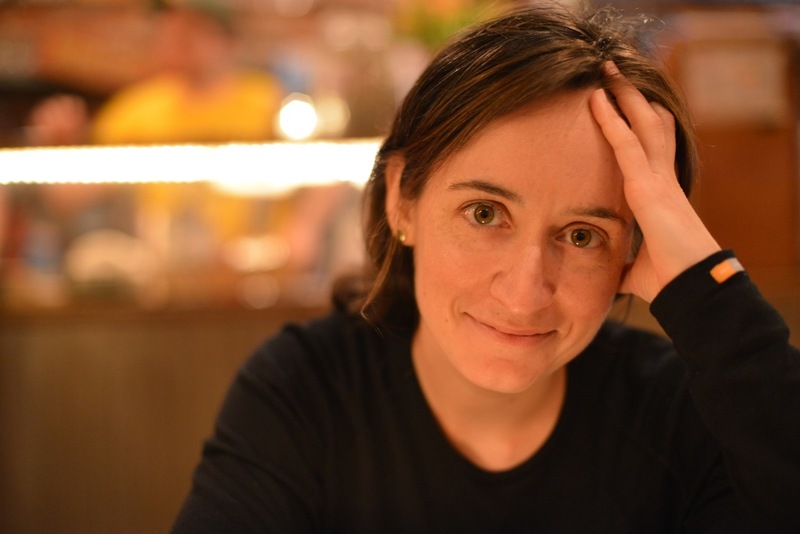 Though she’s a materials scientist by day, Teresa’s writing has appeared in the NY Times’s ‘At War’ column, and an essay called “No One Left Behind” recently won a Words After War writing contest. I met Teresa at AWP, while standing outside a conference room waiting for a panel we were both going to. I’d felt like I’d been surrounded by unusually tall intellectual women for days, so to find someone just an inch taller than me at five-foot-one was a surprising relief. Teresa is slight and soft-spoken, unfussily pretty, wears glasses. You would not look at her and think, “Now there’s a Marine.” And yet, I’ve talked to lots of service members over the years, and her style of speaking definitely fit a mode of respectful forthrightness — of waiting to hear a full question before answering, keeping a sort of reserve — that I think marks a lot of the people who’ve served. No squealy, girly business or anything like that. She just seemed, well, like a very cool person, someone you would want to talk to for a while. I asked Teresa if she’d want to be included with this blog. She warned me right off the bat that part of her memoir centers around an affair she had with a married officer in Iraq. That might not sit well with my audience, she said. I can see why the idea of presenting a story about soldier infidelity to a group of mil spouses made her a little uneasy. But I reassured her that what I’m interested in is good writing and tough topics. I told her my small group of readers could handle it. Because unfortunately, we can’t pretend there’s not some level of mutual suspicion between military spouses and female service members. Siobhan Fallon’s story collection You Know When the Men Are Gone touched upon the mil spouse/ female servicemember divide when it debuted four years ago. In the story “Inside the Break,” a young mom, Kailani, is left behind during her husband’s yearlong deployment. During that time she encounters almost irrefutable proof that he’s carrying on a relationship with a female soldier in Iraq. It’s a difficult situation once Kailani has evidence in hand, but perhaps the most telling part of the story is the Army wives’ initial reaction to seeing that their husbands are even going to be serving with women during the year that they are away. “Look!” Cristina’s voice was tear-free and loud. The other wives glanced at her and then followed the line of her lifted arm…. All the wet eyes watched that final bus, how it revved its engine to keep up. That supply bus held a threat that had never occurred to any of them when they thought of faraway insurgents and bombs and helicopters crashing. That supply bus with its fifteen women. What does it say about us, that military spouses are (sometimes) so suspicious of the small group of women who serve — viewing them as the threat, and not our own, obviously spotless husbands? Why don’t we think about the challenges these women must face, the way they have to constantly keep up with men, present a tough facade, deal (not always, but often enough) with the threat of discrimination and assault at the hands of fellow soldiers, leave children and family members behind when they, too, go off to war? Which brings me back to Teresa Fazio’s award-winning story, “No One Left Behind.” In this story, T (as she’s referred to) receives a birthday visit from the Marine she had an affair with on a FOB in Iraq five years before. Very close during wartime, they haven’t seen each other since. He’s still living with his wife and son. She’s single, working, thinking about having children someday. The details of the story, the spare writing and the core of loss at the center of every word — it’s beautiful writing, and the story has sat with me for weeks. … In my doorway, he’s balder and thicker than I remember, a fortyish military retiree still living with his wife and son. I let him stash his backpack in my apartment. We sit on my sagging loveseat; it dips us shoulder-to-shoulder. Jack attends T’s party, but the gulf of experience between the veterans (himself, T, and their friend Hoss, present by phone) and the civilians alienates him. Partway through, he needs to leave for a while. He returns and finally they sleep, but T is awakened later in the night. These are the stories we should be reading. These are the stories of women at war, women whose lives support and endure the military. The idea of two women — Jack’s estranged wife, the mother of his child; and his soul mate of sorts, T, who served with him but is still unable to comfort him — circling each other from a distance, twinned by circumstance, is very powerful to me. I love this story. I hope you will too. So I’m grateful to Teresa for taking the time to talk with me some more: about joining the Marines as a shy, five-foot-one woman; about the spectrum of perceptions one faces as a veteran; about the challenge of memoir, in which “the most honest writing– the best writing I can put on the page– makes me look like a complete jackass.” Hardly, Teresa — hardly! So now I’m gonna get right to it. 1. Can you tell me a bit about yourself — where you grew up, what prompted you to join the Corps (were your friends and family surprised?! ), and what your experience was like? Sure. I grew up in a suburb of New York City with three younger brothers. I was a small, nerdy tomboy, and I think my family was a bit taken aback by my wanting to go into the military. We weren’t a military family, but one of my uncles was a Marine LtCol, and I deeply respected him. So ultimately my family was very supportive. The stock reason I usually give for joining is “the challenge and the camaraderie,” and that’s true, but I also really needed money for college. I started ROTC in 1998, so 9/11 was far from anyone’s mind. The physical component was tough for me at first; I’m five-foot-one. It felt like I spent my entire freshman year of college running to catch up. But eventually I built stamina and got the hang of the field exercises. After commissioning, following orders and having to appear “squared away” at all times took some getting used to. But things clicked into place when I became a communications officer (keeping an eye on telephone, data, and power networks) and got my own platoon of Marines. They were smart and funny and incredibly hardworking. I still miss them sometimes. I wrote a ton as a kid. Lots of short stories designed to make my classmates laugh. Then, sometime in high school, I became really interested in math and science and just… stopped. I took one writing class in college, but other than that I didn’t write anything for over 10 years. I did keep a journal while I was deployed to Iraq, and after I finished grad school, I just couldn’t stop writing about what had happened over there. It all came pouring out. 3. I understand that you’re in the process of writing a memoir about your experience in Iraq. Having read a little of your writing, I can see that you tangle with some tough themes: violence, marital infidelity, post-traumatic stress. How do you meet the challenge of tackling these topics in your writing? Has it been difficult? It’s definitely been difficult. Fortunately I had a few years of counseling under my belt before I even started typing, so I had made a lot of progress in healing old wounds. I try to be as honest as possible. It takes a few drafts until I can really get to the emotional core of these topics; the truth can be awkward and ugly and frightening. And since this is a memoir, usually the most honest writing– the best writing I can put on the page– makes me look like a complete jackass. So it’s taken some effort to separate myself from the Teresa-character in the book. But one unexpected gift is that after reading or hearing my stuff, people often tell me their own stories. So confessional memoir torches ego, but builds empathy. That’s been liberating. So have some of the resulting conversations with family and friends. 4. Your essay “No One Left Behind” includes a scene at the narrator, T’s, 29th birthday party in which interactions with two fellow Marines (also deployed with her to Iraq) intersect with friends from her “current” life back in New York City. It’s a moving scene because the gulf of experience between the civilians and the servicemembers is so evident and feels so insurmountable. Do you see this divide lessening, and for their part, what can civilians do to understand the experience of the 1% of our population who serve in the military? If there were one critical thing you’d want civilians to know about our most recent veterans, what would it be? Veterans have a wide range of experiences; there is no single monolithic “veterans’ experience.” The military contains myriad jobs: communications, logistics, infantry, artillery, administration, supply, piloting aircraft, maintenance… and that doesn’t even begin to cover it. Not everyone is going house-to-house fighting with a rifle. Not everyone comes back with PTSD. When I hear other veterans’ stories, I think back to my deployment, and frankly, I’m pretty sure I got off easy. And then I hear *civilians’* stories of trauma, assault, accidents, disease– and realize that those civilians have had far more intense experiences than some veterans. We’re all human. So I guess I’d tell them that we *are* you. We may have been through some crazy stuff, but maybe you have, too. So let’s engage in respectful, empathetic dialogue that highlights our common humanity. Also– please don’t ask us if we killed anybody. I can’t believe I still have to say this, but I just got asked that last week, so I figured I’d throw it out there. 5. 2014 was a pretty good year for veterans’ writing, with several notable books by veterans receiving well-deserved attention (most publicly, Phil Klay’s Redeployment winning the National Book Award). I’m going to interrupt you with a shoutout to Phil, because Redeployment was absolutely stunning. Just gorgeous prose. And at the same time I have to thank him, because none of the narrators in Redeployment were female… which leaves plenty of room for female veteran writers! Still, women veterans have not garnered quite the same attention — perhaps because there are fewer of them? Perhaps because fewer are writing novels? Why do you think this is the case, and do you see this changing in the future? If you had to make a “required reading list” of women veterans who write, what books would you put on it? I think it’s for both reasons you suggest– women are only about 15% of the total force (and the Marine Corps is only 7% female). So you have an already-smaller number of female veterans, and then only a very small percentage of veterans of either gender become writers. The numbers are not huge. But I’d add a third reason — judging by the volume of Iraq & Afghanistan-themed books and movies lately, the image of a servicemember in American pop culture is a white male infantryman (or Navy SEAL). There have been a few TV and movie characters who are female veterans, but I can count them on one hand. And with the notable exception of my friend Maurice Decaul, an incredible poet and playwright, we also have yet to see much published war writing from people of color. I think we’ll see that changing in the next few years, to reflect the actual demographics in the military. At least I hope the market gets onboard with that! Kayla Williams has written two memoirs – Love My Rifle More Than You & Plenty of Time When We Get Home. Mariette Kalinowski wrote an unforgettable short story in the anthology Fire and Forget. Kristen Rouse and Lauren Halloran currently blog and write articles, but have also written fiction for an upcoming anthology (which I’m also in). Nope, I think that’s about it! Thank you so much for having me! It’s been my pleasure, Teresa. Thank you!